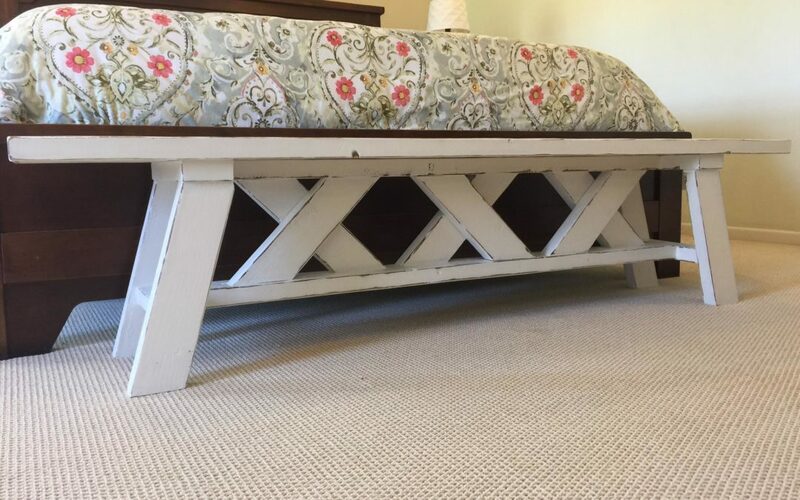 My FAVORITE Rustic DIY Bench! - Brushed Design Co. 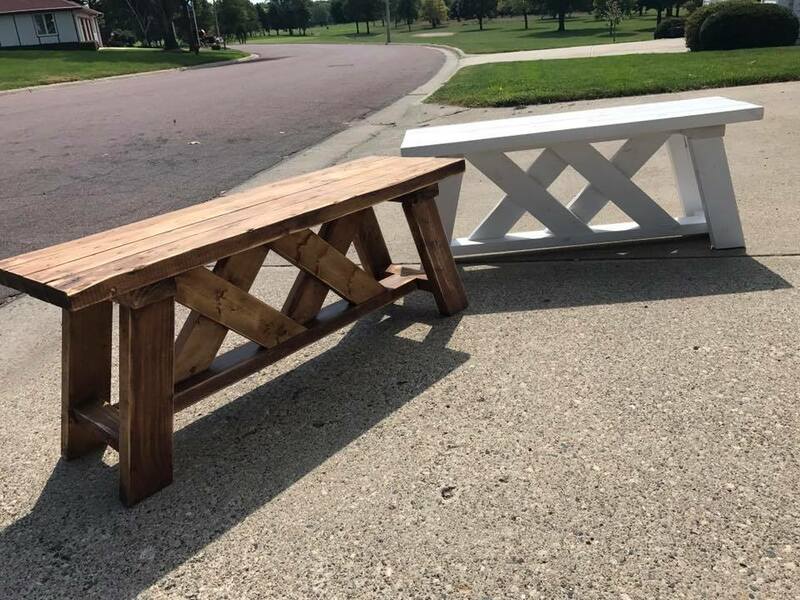 Build your own rustic “X” bench! I love benches! A bench can go in your garden, your porch, your entryway, the foot of your bed, next to your table…the possibilities are endless! My favorite bench build comes from Amy at Her Tool Belt. She developed plans for a great beginner project and even updated the original plans to accomodate people with different tools to use! Her website is full of amazing projects for every part of your home. I know you’ll love it as much as I do! I’ve built a few different sized benches from this plan. Amy’s plan easily allows for modifications on the size of the bench. My first time building this bench was when I built one for the foot of our king sized bed. I extended the size of the four boards for the top to 70 inches long, added a third “X”, and adjusted the rest of the plans accordingly. The only other part of the plan I needed to adjust was the two horizontal inner frame boards. The top board was cut to 46 inches and the bottom board was cut to 52 inches. The rest of the cuts and dimensions remained the same. I typically use the first version of her plans that utilizes a Kreg Jig Pocket Hole System but she has an updated version that has a little easier assembly without the use of a Kreg Jig. I find when painting your bench, it is easier to fill the countersink holes with wood filler and follow along with the second version of the plans. However if you are going for a stained look, I recommend using the first version of the plans that include the use of a Kreg Jig. Both plans are easy enough for the beginner and only require about $15 in lumber! After the bench was built, I stained the edges of the boards in Minwax’s Dark Walnut stain. I then painted the bench in Fusion Mineral Paint’s Casement and lightly distressed the edges using a 220 grit sandpaper. It’s the perfect bench build for anyone who is looking for a quick and inexpensive project with a fantastic result!